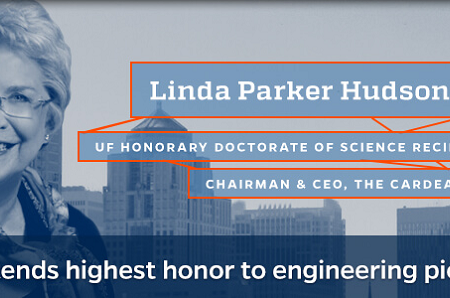 Linda Parker Hudson, the first woman to lead a major aerospace and defense company, has received an honorary doctorate in science from the University of Florida, the highest honor the university can give an individual. The degree was conferred Friday during UF’s doctoral commencement ceremony. Hudson, chairman and CEO of The Cardea Group, has been a pioneer for women taking leadership roles in engineering and business. She is retired as the first female president and CEO of BAE Systems, Inc. Under her guidance, the global, U.S.-based defense, aerospace and security company achieved an annual revenue of over $12.75 billion while employing approximately 40,000 people — many of them engineers. In her current position, she consults with highly regulated industries to help develop adaptive strategies for competing in a constantly changing world. As a little girl in the 1950s, Hudson wanted to grow up and fly airplanes. When cultural restrictions told her she couldn’t do that, she dove into engineering and decided she would build them instead. Hudson graduated with honors with a systems engineering degree from UF in 1972. She’s held a variety of senior management positions in the defense industry — working at Harris Corporation and Ford Aerospace, and then leading organizations at Martin Marietta through the Lockheed Martin merger and subsequent divestiture to General Dynamics. She’s been cited as one of Fortune Magazine’s 50 Most Powerful Women and Washingtonian Magazine’s 100 Most Powerful Women in Washington. In addition to her corporate accomplishments, she has also made significant contributions as a philanthropist and as an advocate for social justice. Hudson remains active in the alumni and athletic associations at UF and serves on advisory boards for the College of Engineering. She was honored as a Distinguished Alumnus in 2010 and is a member of the Industrial & Systems Engineering Hall of Fame.